You have several options to when converting VHS to DVD. Let's look at them one by one and then you'll be ready to choose the one that's best for you. If you own a combination DVD and VCR player/recorder, it's almost painless to pop in the VHS tape and a blank DVD, press a few buttons and directly record the old tape to a shiny new DVD disc. 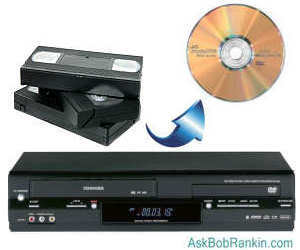 A slight variation on this method is to connect your VCR to a separate DVD recorder unit. If you don't need to modify the video (editing, adding chapters and custom menus), this method is the easiest and most direct. If you don't own a machine that can play VHS tapes, don't despair -- they still make them! You can find the Samsung DVD-VR375 DVD Recorder VHS Combo at Amazon, and I'm sure you can find used VHS/DVD recorders on Ebay for even less. Just about any digital video camera (camcorder) can serve as the tool to help you copy directly from your old VCR into a digital format. Usually it just requires hooking up a cable (may need to be purchased separately) from the VCR's Video Out port (the red, white, yellow connectors) to the Video In port on the camera and pressing a few buttons. Each camera works a bit differently, so follow the instructions in your video camera's manual for recording from an auxiliary input. This is a slow process because it is a re-recording of what is on the tape to the DVD or digital format, but it is fairly simple and requires no additional hardware if you already own a video camera. Special devices like the DVD Xpress Video Converter from ADS Tech make it easy to transfer directly from VHS tape to a DVD disc. Basically, this is an external device that takes the place of the video camera in the previous scenario. 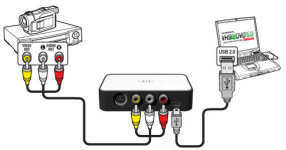 You connect the VCR to the device with a standard red/white/yellow cable and then connect the device to your computer with a USB cable. These devices may be more cost effective than a video camera and a little easier to use. This unit is no longer manufactured, but you can still find them for sale online. Another option is the VHS to DVD Deluxe from Honest Technology. This is a hardware software combo that comes with a "Vidbox" video capture device that supports VHS, camcorder, Beta, and 8mm tapes. The included software offers an "Easy mode" for one-click VHS to DVD transfer, and "Advanced mode" which allows for editing, removal of unwanted scenes, transition effects, and easy uploading to YouTube. The product is listed for $79 on the vendor's website, but I found several for less at Amazon. Most computers sold in the last few years will have the basic system requirements needed for dealing with the digital version of your VHS recording. You should have 1GB or more of RAM and at least 10GB of hard drive space available. Oh, and a DVD burner of course, and a stack of blank DVD discs. Some computers have combination CD/DVD drives, which may or may not be able to burn a DVD. Don't assume that because you can burn a CD, you can also burn a DVD. Look for the "DVD-RW" logo on the drive door, or consult the documentation if you're not sure. If you need a DVD burner, external USB-connected models are easier to install than internal CD/DVD drives. Once you capture the video on your computer, you can use movie editing programs such as Windows MovieMaker, QuickTime or iMovie (Mac OS) to manipulate the video as desired, add subtitles, chapters, etc. Make sure the DVD software and/or recorder is set to "finalize" the disc. A disc that's not finalized can be played on most computers, but not on standard DVD players. If you run into trouble transferring a copyrighted movie, try using a "stabilizer" such as the Sima CT-200 (also sold as the Clarifier SX by Facet Video.) Check out VideoHelp.com for more video editing software and tutorials with wonderful step-by-step instructions. Here's one thing to consider: you might not need the physical DVD at all. You can convert VHS to digital format and save the video to a hard drive. You can view the video on your computer, or store the digital version as a backup of the video tape. A final option for those who don't care to dirty their hands with wires, bits and bytes is a service bureau. Many services offer to receive your VHS tapes by mail and return them with a DVD or Blu-ray equivalent. One example is Home Movie Depot. For around $19 per VHS tape they can walk you through the preparation process and help you get the tapes to them for conversion. They also offer an "Easy Box" option, which lets you fill a large UPS, USPS Priority, or FedEx box with up to 25 VHS tapes and they will transfer it all to DVD for a flat rate of $299. Another option for VHS to digital transfer is iMemories. Their price is $12.99 per videotape. The catch is that you don't get a DVD. Instead, they store your videos online, where you can view them for 30 days at no charge. An iMemories Cloud subscription costs $6/month or $50/year. The cloud option lets you store, organize, edit and share your videos with others if desired. You can download the digitized videos, or have them burn a DVD, but that's another $10 charge. WalMart has a similar service which charges $24.96 for 1 VHS videotape. You do get a DVD, plus online viewing, editing and sharing capability. The U.S. National Institute of Standards and Technology's 2005 report on CD/DVD Care and Handling offers information on the subject of CD/DVD life expectancy. In that report, they say: "...there is consensus that, under recommended storage conditions, CD-R and DVD-R discs should have a life expectancy of 100 to 200 years or more. CD-RW, DVD-RW (writable) discs should have a life expectancy of 25 years or more." However, the U.S. National Archives and Records Administration has a report called Frequently Asked Questions (FAQs) about Optical Storage Media which says "CD/DVD experiential life expectancy is 2 to 5 years even though published life expectancies are often cited as 10 years, 25 years, or longer." They discuss various factors which can impact life expectancy and recommend that you test your media every two years to make sure it's still readable. The useful life span of CD and DVD discs is affected by temperature, humidity, exposure to light and day-to-day use. My advice is to buy quality name-brand discs, keep your DVDs in a cool, dry place, avoid direct exposure to sunlight, and hopefully they will last for a decade or more. Storing your videos and photos in digital form, with regular backups, is an even better strategy. Should You Keep Your VHS Tapes? "Optical discs are NOT the best archival media. No consumer-grade disc manufacturer makes claims about disc reliability, but latest word is the archival stability of optical discs does not even approximate tape. VCR tapes, like audio tapes, play until the oxide coating is damaged or covered by contaminants. Or until, at the extreme, when the acetate tape and/or oxide binder breaks down chemically. There is another, huge advantage to tape. If a portion of the recording becomes damaged or otherwise inaccessible, the rest of the tape is still readable, in most cases. Not so for digital discs -- if a byte fails in the most critical area, the entire thing can be lost. Keep your family memories longer on VCR / audio tape, and store the tape under best archival conditions, away from heat, humidity, strong magnetic fields and sunlight UV. Maintain a tape player (for the format used) in operating condition, and protect the player with storage under best conditions possible. If you plan for the long term, look into the condition of rubber pressure wheels and belts-- these must not "dry out" and crack. The ideal strategy is to copy the tape to optical disc, archive the tape, and use the disc as source material. Check the disc yearly for problems, and re-record a disc from the tape source, if necessary." Most recent comments on "HOWTO: Convert Your VHS Tapes to DVD"
Great advice on transferring my old VHS tapes to digital format. What do I do with all the picture slides (remember those?) I have. What is the best way to transfer them to digital format? Even better would be to convert your VHS to a digital format. I ended up converting all my DVD's and VHS tapes to digital format and I couldn't be happier. Yes it took a while but it was worth it. I also have back ups so I'm good to go. It was nice to get rid of all that clutter. You can get the best bargain on a VHS player at a Thrift Store ... and also help them too. Caveat: some have stopped accepting them as donations, so be sure to ask them, and tell them you are in the market for one if they don't routinely accept them. We found Goodwill usually has an unending supply of older electronics, so check them out as buying from eBay or Amazon will incur quite a high shipping fee. Additionally, I create an ISO file (using ImgBurn shareware) from each DVD. After mounting and testing each ISO file, I have saved copies of them (over 200 DVD/ISO files) onto an external hard drive that I store in a bank safety deposit box. So I have the three archival formats (original tape, optical DVD and digital ISO file) at home plus a copy of the ISOs offsite (at the bank). Bob's article appears to miss a point. My VCR recorder can be hooked to my DVD recorder. Then I press play on both units simultaneously and a tape to disc recording is made. My equipment is not unique nor special in any way. From their web site: "M-DISC preserves photos, videos, documents, and files for 1,000 years." It's probably a good idea to place a reminder to re-record after about 800 years, though. @TIM HANSEN- Your best bet for transfering prints or slides to DVD is to send them in to a company that specializes in that type thing. Walgreens offer the service based on how many prints or slides you have. Same applies to old 8mm movies. I have seen the results of slide transfer and it is quiet good. They come back in a slide presentation that you operate with your remote. I suggest you try it before losing the old slides or prints. Yes, pay attention to Bob Greene's comments. In the first decade of this century I copied most of my VCR tape collection to DVD. I did lots of research on which were the best DVD-Rs to use. 10 - 15 years later I find that a good deal of my DVDs do not play while the VCR tapes are still fine. And, unlike the DVDs, I did not pay much attention to how I stored them - they were subject to heat and cold over the years. The re-writables are particularly worthless for backup. As Michele commented, probably a much better idea is to put it on a hard drive. @Tim Hansen - I've got lots of slides from the 1970s, and several years ago I bought a scanner that has a special attachment for slides. I digitized most of my slides that way, although some day I have to finish up that project. I had been recording on tapes (movies and television series) since 1983 when I retired in 2008 and decided to convert them. I had over 2200 tapes, each six or eight hours in length. I used three VCR-DVD combo recorders. It took me almost five years to complete the project. What no one mentioned was the reason I did it: space. DVD's simply take up less room than tapes. great scanner for documents - digitize your paper bills etc. Maybe I missed a comment, but are there better quality VHS tapes around? If they outlast DVDs, would tape to tape transfer be a better way to go? Failed to add, if there are better VHS recorder/players available. Don't expect DVD quality especially from tapes recorded 'off the air'. In my experience, by today's standards the quality, acceptable at the time, was not great to begin with and the tape has probably degraded over the years. On the other hand, the tape is probably the only source for the material and is worth converting for that reason alone. Here is the most important reason to transfer your VHS tapes to another media NOW: VHS recorders are no longer being made! The video recording heads are no longer available from any manufacturer. The last of the VHS recorder companies (Sanyo/Funai) will stop making them very soon, if they haven't already. This has driven the cost of a NEW legitimate VHS/DVD combo unit made for USA markets upwards of $500. If you plan on keeping VHS tapes around, make sure you have (or purchase NOW) a good working VHS machine before they are permanently gone. Hi, just a newbie, but, wondering. I record my movies and videos onto my hard drive VOT I think. How long would these videos last on my hard drive? Can I just copy them on a specific HD and leave that HD as a storage and then copy and burn these files onto disc when I lose or damage a family video? The connection diagram is fiendishly clever. It almost looks like two outputs are shorted to each other!